Becca and I don't go back that far, so when I was asked if I would like to pop in to my local Becca counter for a proper getting to know you, I jumped at the chance. Last Saturday Kristi of Becca educated me about the brand's history -- Becca was started 10 years ago in Perth by Rebecca Morrice, whose mainstay focus has always been on beautiful skin. Everything else is a thoughtful, yet secondary, addition. In 45 blissful minutes I was naturally elevated from no makeup Nicole to a better version of me. Here's a picture heavy walk down memory lane. Discussing Becca's Compact Concealer, complete with two types of coverage (medium and extra) for those days when you need a little less or more. Which Shimmering Skin Perfector did I pick: Opal, Moonstone or White Pearl? Lips like sugar.. That's Becca's Beach Tint in Watermelon for lips and cheeks. According to Kristi this particular mirror has the best light. 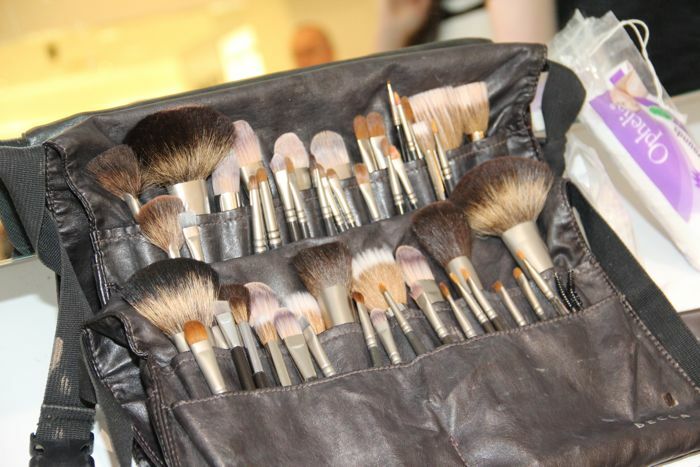 The One Perfecting Brush - my personal favourite and talk about soft!! And how did the makeup perform? In a word, great! Everything lasted, never budged and looked just as fresh as when it was first applied. 9 out of 10 bags — I loved learning about and experiencing Becca's makeup range. Before leaving, I bought myself The One Perfecting Brush, Beach Tint in Watermelon and Mineral Blush in Damselfly. A special thank you goes to Kristi for all her tips, tricks and time, as well as my husband, Scott, for taking pictures of silly ol' me. *PR sample (Special Occasion Makeup session) provided – Thoughts and ramblings written here are completely my own.